Sei in: Home / News / Mostra negli Stati Uniti, North Carolina. Mostra negli Stati Uniti, North Carolina. Attraverso l’inchiostro della sua penna Francesco Corni ci propone un viaggio nel tempo e nello spazio, ad esplorare le tecniche di costruzione degli edifici più famosi del mondo. 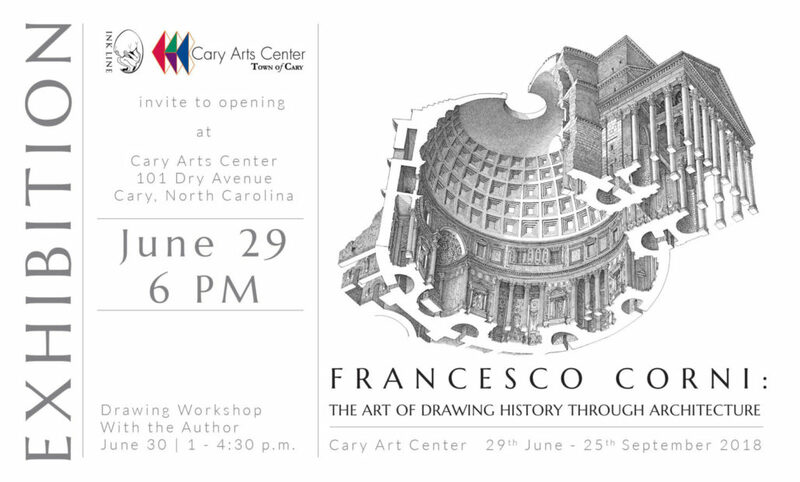 Through the ink line of his pen, Italian artist Francesco Corni proposes a journey through time and space, in exploration of the construction techniques of the important monuments of the world. The exhibition will be a path through the historical epochs and the different ways of building of the great civilizations: from Stonehenge, passing through the Greek temples and Roman monuments up to the present day, we will see how at all times man has evolved his knowledge and his constructive technique. “Architecture is a testament to the evolution of Man’s mind, of how the technique has evolved over time as a function of a new way of thinking about space and beauty” -Corni. http://www.inkline-edizioni.com/site/wp-content/uploads/2018/06/invitation.jpg 964 1600 Elisabetta Corni http://www.inkline-edizioni.com/site/wp-content/uploads/2015/10/logo_temp.png Elisabetta Corni2018-06-15 09:37:562018-06-15 09:38:53Mostra negli Stati Uniti, North Carolina.